The Imaginary Garden is featuring the art of Kelly Letky. Please visit Kelly’s website, The Blue Muse, and her Etsy store: Blue Muse Fine Art. Such a pretty picture! Your words fill me with a sense of joy and renewal, reminding me why I love the birds in my garden. Aw, this is one of my favorite pictures, one of my favorite birds, they really do have such a glad song, don't they? I love what you did with this! your photos are fantastic, Kelly. thanks so much for sharing them with us. "spirits to nurture" ... This is really one of the most important jobs around. 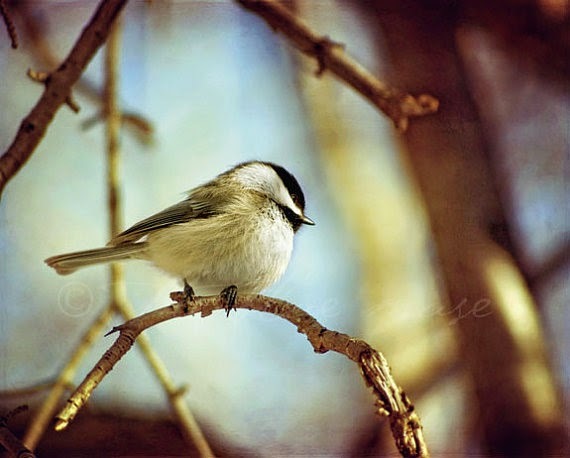 Chickadees ..such a wonderful name of a bird.. To have them as company in your garden.. But we have other birds to keep us company..
Ah, fill 'er up, don't ever run low. Love this .. every time I visit your blog I imagine you 'pecking' away at that little typewriter!! Kelly's photography has a way with birds(and flowers) that you amplify here--even when the feeder is empty, there is joy, a reason to sing, if you are small and have wings. Right now it's hot and dry here, and the feeders have been replaced with sprinklers as places of delight and congregation--I could watch for hours. Loved this, Marian. I love this picture- almost used it. You did it proud with your words. "each encouraged to sing her own song"---what a great reminder for us all. "love's cost no discouragement" I love seeing the chickadees return to our feeder. Such a beautiful little bird. May we each sing our own song. Their glad songs are one of my favorite to hear...especially the end of winter.